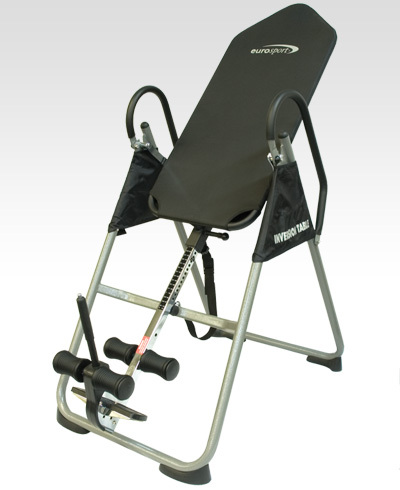 The FS Inversion Table is designed for superior safety and functionality. The quality steel frame and corner stabilizers ensure solid support for increased safety and comfort. A key is the heavy duty ratchet handle for ankle securing that is easy to reach and easy to set for ensuring maximum support. This Inversion table folds flat for easy storage. Durable, rubber coated safety assist handles. Easy to use height adjustment, using pop and pin and security knob for heights up to 6'8"
Solid commercial grade steel tubing. Redesigned, erogonomic soft rubber ankle grips for improved security and comfort. Unique safety covers protect clothing and fingers. Scratch resistant silver powder coat finish. Adjustable tether strap for multiple angle adjustment. Inversion therapy has been used for hundreds of years to treat back pain, to increase circulation and proper alignment, and to decrease stress. Many medical studies have been done on the use of inversion therapy supporting its many health benefits. Basically, inversion therapy uses gravitational force to elongate the spine, relieving pressure on the discs, ligaments and nerves. It also relaxes tense muscles and improves the flow of lymphatic fluids, which inevitably flush the body's wastes. On the whole, the inversion table provides a safe, comfortable motion to complement any fitness/wellness regime.